Moving from one city to another, or even to a different address within the same city, brings in many changes. One of the first things people do when changing an address is to notify their paper delivery, postal and bills. However, the one thing people seem to forget more than most is changing the address on the voter card. This can cause either a lot of discomfort during the voting season, or at worst, cause you to lose your vote altogether. Avoid that hassle this election season with this simple guide. By filling up Form 6 from the Election Commission, you can ensure your vote remains available to place during the elections. Go to the NVSP website and select the option that says "Apply online for registration of new voter/due to shifting from AC" (). Selecting the option will take you to the Form 6 page. The NVSP website has many options to choose from. The one you need is the one that says "Form 6". Form 6 is divided into a number of sections, each which require you to fill in your details either mandatorily or optionally. Rule of thumb, if the field is marked with a red *, it's a mandatory field. This is the first field, where you should choose either you're a new voter or someone who has moved to another constituency. Basic your basic details, like your name, age and a relative. Here you add your current residential address. Do be careful about which district you select. Your permanent residential address goes here. In case your current and permanent address may be the same, it should be easier to fill the fields. While the filed says 'optional', giving a phone number could be useful so you can keep track of the progress of your application. 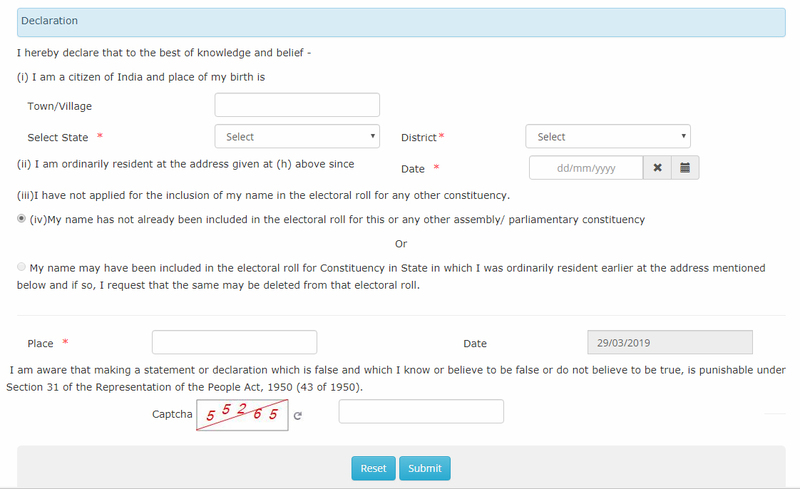 Add your photo, age and address proofs and choose what type of document you are choosing. Complete the declaration, punch in the captcha and submit. With this, as long as your data is accurate, your work should be done.